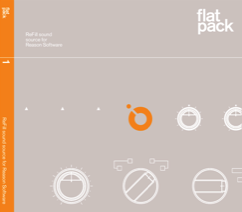 The Flatpack concept is to create fully tweak-able instruments and modular sound sources rather than sample patches. The Refill format, and especially the Combinator, make Reason one the best sound design environments. Each of our Reason Refills are large, varied compilations with patches for many of Reason's instruments. 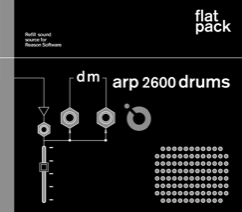 Flatpack 2 and 3 use the Combinator to create brand new deep sound sources. Daniel Miller ARP2600 Drums is a FREE! Refill for registered users at flatpacksounds.com. A Daniel Miller exclusive produced with Flatpack. Throughout these pages you can hear audio examples created with our refill collection. 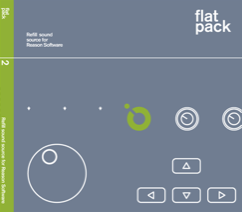 Once registered on flatpacksounds.com, you'll find a number of additional refills - free to download, adding even more sonic content to you Reason library. Flatpack 1 was born out of our desire to make a truly portable version of our vintage analog synth studio. FP1 predates the Combinator, so we had to use a combination of thoughtful sampling and patch design to recreate our instruments with Reason's basic devices. Since then, we've been able to add to Flatpack 1 by creating Combinator updates, available to download by registered users. 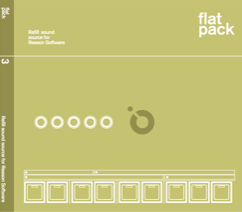 Flatpack a warm, lush library of multi-sampled pads and textures. And for added measure, we threw in some distinct and atmospheric instruments like the Hohner Melodica. The Reason Malström and Subtractor synths provided us with more opportunities to explore the weird and wonderful. Our rule of thumb for patches, drum samples, and REX loops is simple: no fillers. There’s no point in packing a library with samples you skim over to find the good ones. We tried plenty of off the shelf sample libraries with Reason, but never seemed to get the control and nuances of a true analogue based synth set-up. Flatpack is not a sample CD that happens to support the Reason Refill format. It’s a bespoke sound source, tailored to take full advantage of Reason’s sample and synth manipulation features. Experimenting with Reason’s ReDrum module, we realised with skilful sampling, the controls could be made to emulate our classic drum machines. Flatpack combines our vintage signal path with 24- bit recording to get the deepest and crispest sounding patches. 50 NN-19 patches and sample sets, including: TB303, Moogs, MS20, VP-330, The legendary Casio VL-Tone! 200+ MB of gorgeous, ambient, and weird textures included as .wav data for versatility. Requirements: Reason v 2.0 or higher. All tracks above where created with exclusive use of Flatpack 1 - Reason Refill. is built largely around 5 new instrument concepts constructed within Reason's Combinator environment, and because of the endless programming possibilities, you'll find numerous variations of the following shells..
is a family of Combinators for generating soundscapes, pads, textures and just about any kind of rich evolving sound beds you can imagine. 100 Scope starting points are provided in the Flatpack 2 refill, each of which can be customised to go off in any direction you like. Each basic Scope contains 2 elements from Flatpack 2's library of weird and wonderful recordings (all looped seamlessly of course). A crossfader allows you to blend the sounds to your liking while other controls determine how the sounds evolve and interact. Scope is dark, disturbing, and atmospheric and perfect for film/TV music..
is our framework for re-creating classic synths. We've sampled and looped the raw waveforms from our favourite synths, then carefully copied the signal path and modulation options, filter and LFO ranges, etc. from the original instruments. Combinator's fully modular environment, and assignable programmable front panel system, allows us to create far more accurate emulations than any standard sampler could manage. is our Combinator-based drum machine. Our starting point was inspirational drum machines like the Korg ER-1 and Elektron MachineDrum, but with the added flexibility of design afforded by the Combinator. Boxmoor offers improved sound and real-time control compared to the original ReDrum instrument. is a collection of rex-based loop players. Rex Dex brings incredible control and new life to loops in Reason, with several tricks up its sleeve for mangling and transforming your rex loops. Of course, we've produced a collection of new loops to use with this Combi, in addition to all your favourites from Flatpack One and any other refill.. There are lots of brand new effect unit devices built in Combinator that make up our FP2 Outboard collection. There are also all the usual individual instrument patches and kits you'd expect to keep you inspired. All Demos above where created with exclusive use of Flatpack 2 - Reason Refill. patches are hybrid synths built from multiple Reason devices. In most cases, the “oscillators” are special NN-19 patches that use very short, looped waveforms sourced from classic analog synths. There are several different designs. In the sounds marked as [mono], three of the NN19 oscillators are stacked up and routed through a Thor. The Thor’s filters and envelopes are used to shape the sound. In the polyphonic patches, individual NN-19 and Thor sound sources are combined to create rich new sounds. There are also sounds which use the RPG-8 arpeggiator, and classic analog sequencer sounds using Thor's sequencer. uses a library of longer samples, combined with Element sources and Thors, to produce long, evolving pads and soundscapes. As well as a source of unusual layers and textures for music tracks, Darwin is a sound design tool for generating atmospheric sound beds for film/TV. Most Darwin patches feature a crossfade knob on the front panel that blends two different sonic textures. is a drum machine built in Combinator, featuring both sampled and synthesised sound sources. A Redrum provides 10 sampled hits, while 4 Thors generate the synthetic sounds in real time. The Thor sounds can be muted or enabled from the Combi front panel. Another Thor can be found at the top of the Combi, with panel controls for adjusting Delay and Chorus effects. To sequence drum patterns with Boxmoor II, you can use both Redrum’s internal sequencer, and the step sequencers found on the Thors. You can also play all the sounds in Boxmoor II from a MIDI keyboard, and record drum performances to the main sequencer. The keys in the octave C0-C1 play and alter the synthesised sounds. Keys C1-C2 play the sampled drum sounds. family of Combis are loop players, beat generators, and live groove boxes. The raw material is a library of REX loops, split into Music and Beats categories, and further separated by where they sit in the frequency spectrum. This enables the loops to be layered up, as in the Triple Dex patches. The REX DEX II patches allow REX loops to be added to a Reason song without having to use the sequencer or Dr Rex’s Preview button. The Play/Stop button on the Combi front panel will start or stop a loop, quantised to the next bar, regardless of how long the loop is. The Interleave Combinators cut together any two loops using automated crossfading, and shuffle the slices, creating endless loop variations. Use the loops in Flatpack 3, your other Flatpack ReFills, or any other REX library. is the latest in the award-winning series of Refills for electronic music producers and sound designers. Reason 4 Ready, FP3 has been in development almost as long as the Reason 4 Factory Sound Bank, and is designed entirely for Reason 4. No surprises then that the Combinators make full use of the new sounds possible with Thor and RPG-8. The enhanced Combinator, and Thor's deep CV routing capabilities have also been used to gain a new level of control of patches. New Instruments for you Rack. At Flatpack we want to create instruments, not sample libraries. At the heart of FP3 are 4 families of Combinator 'shells' from which we have built our patches..
Thor Sounds FP3 includes a library of straight Thor patches. Synth Starter Patches Thor is a deep modular synth. We've provided a collection of starting points that will let you create your own sounds using a variety of classic synthesis techniques. Combinators Thors are used in many of our Combi patches alongside sampled material - a 'best of both worlds' approach. All Demos above where created with exclusive use of Flatpack 3 - Reason Refill. Daniel is the founder of Mute Records, probably the most famous record label involved in electronic music, and home to the likes of Depeche Mode and Goldfrapp. He also makes music (e.g. The Normal's classic 'Warm Leatherette'), and has his own radio show. And he's also a fan of Flatpack! Daniel has an extensive analogue synth studio, but has used Reason extensively on his laptop and wanted to build a library of drum sounds to take on the road. Daniel set about sampling a large selection of drum patches created using his ARP2600 modular synth. Flatpack took care of editing the results and creating appropriate Redrum kits ready to pack into the ReFill format. In exchange, we get to share it with you!! has been built around our Boxmoor Combinator. Our starting point was inspirational drum machines like the Korg ER-1 and Elektron MachineDrum, but with the added flexibility of design afforded by the Combinator. We also added a RV7000 Spring Reverb patch, to help emulate the classic ARP 2600 Spring reverb. Giving a more realistic ARP sound to the patches. This can be easily tweaked using the assigned controller on the Combinator front panel controls. DM ARP2600 Drums offers improved sound and real-time control compared to our original ReDrum instruments. Originally available as 3 sets of Redrum kits, we have now packed all the drums into a single Refill using our Boxmoor drum Combinator. All Demos above where created with exclusive use of Daniel Miller ARP 2600 Drums Reason Refill. Patterns were created using a Genoqs Nemo MIDI sequencer, triggering each of the Refill's Combinator Patches.